Bird's nest ferns (Asplenium nidus) are actually one of two Asplenium species found in cultivation. The other, often called the spleenwort or mother fern (Asplenium bulbiferum), is much harder to grow and looks nothing like its cousin. These ferns are naturally epiphytic, meaning they grow on the surface of other plants. In their rainforest homes, they can be found growing high in the crooks of trees. They grow in a series of erect, spoon-shaped, and apple-colored fronds that rise from a central rosette. Healthy plants can have fronds up to 3 feet, but this is rare in most indoor situations. These are beautiful plants that require a bit of babying to reach their fullest potential. Mature Size: Fronds grow to 20 to 59 inches long and 4 to 8 inches broad. Bird's nest ferns are beautiful and many conservatories and greenhouses boast impressively large specimens. They are a natural to group with orchids, bromeliads, and other rainforest plants in a display. The key to a healthy bird's nest fern is providing enough warmth and moisture. Given these two conditions, the ferns can withstand higher light levels. One of the best places to put a bird's nest fern is on a shower ledge or the wide edges of a luxury bathtub in a bathroom near a window, where it will get optimal humidity and warmth, along with sufficient light. Outdoors, these ferns have been known to attach themselves to trees and grow directly on the tree, especially if they can find a spot between branches to nestle in. They get humidity from the tree and outside environment and shaded light from the branches and leaves of the tree. If you are caring for your bird's nest fern correctly, it can grow quite quickly and regularly. The new leaves will constantly emerge from the central area of the plant, or the "nest." Do not touch, move, or handle the new delicate fronds as they emerge from the nest. They are extremely fragile. If you touch them, there is a high chance of them becoming damaged or deformed. Bird's nest ferns are non-poisonous plants; they are safe for humans, dogs, and cats. These plants need filtered light to light shade. Don't expose to direct sun other than the very early morning sun. Placing the fern by an East or Northern facing window is ideal. Plant the bird's nest fern in loose, rich organic compost or a peat-based potting mix. A mixture of 2 parts peat and 1 part perlite would work well. Otherwise, try a peat-based mixture with organic material. These are true jungle plants. Keep their compost moist and provide the highest humidity possible. Don't let the plant become soggy. Also, avoid watering right into the "nest" as that encourages mold and rot. Water the soil rather than the plant. The bird's nest fern will thrive in a warm area. Keep the temperature between 68 and 80 degrees Fahrenheit. Cold drafts and sudden temperature drops will not be appreciated. The plant loves humidity and will thrive in humid environments like the bathroom, a greenhouse, or terrarium. You can even run a humidifier nearby the fern. During the growing season (April through September), fertilize about once a month with weak liquid fertilizer. Don't put fertilizer pellets in the central cup or "nest." Withhold any fertilizer during the winter, when most plants are in their resting phase. Too much food will cause deformed leaves and/or brown or yellow spotted leaves. Bird's nest ferns prefer to be slightly underpotted. As naturally epiphytic plants, they are used to growing in a minimum of organic material and mature plants will elongate above the soil level as the fern grows and sheds lower leaves. The problem, of course, is that large ferns will easily tip over their smaller pots. When repotting, usually every other year, use the next pot size up and refresh the compost. Bird's nest ferns are not easy to propagate and cannot be divided, as other fern species can be. They are usually raised from spore or tissue culture, which means propagation is usually beyond the reach of most home growers. 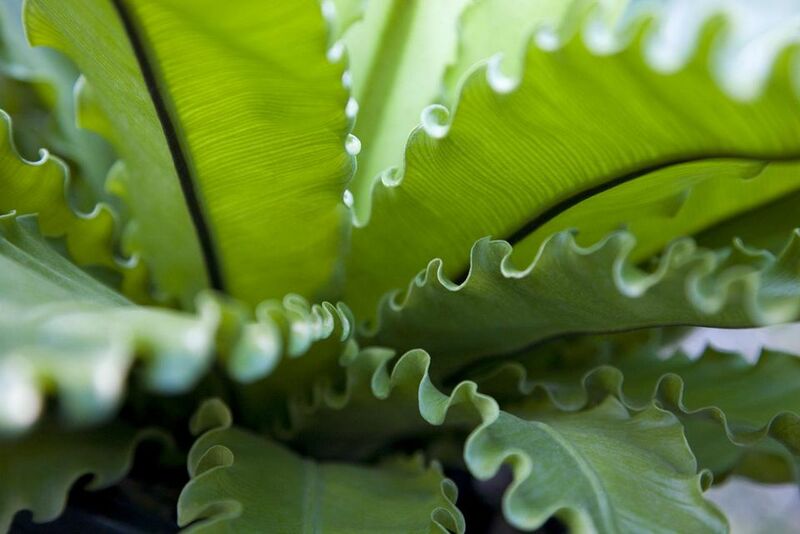 Some varietals of bird's nest fern have been developed, usually with crinkled or frilly leaf margins. Mother fern (also called spleenwort) is sometimes available at the nursery or online, but this is a much more difficult fern to grow indoors than bird's nest ferns.